MK Aryeh Eldad asks why witnesses have not been questioned about Egyptian soldiers' alleged involvement in murders. 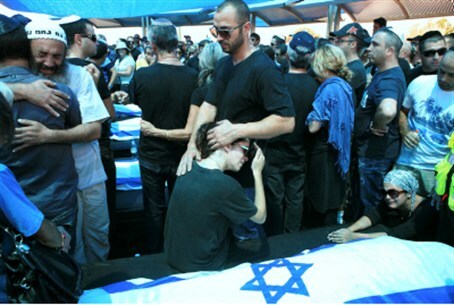 Funeral of civilians murdered near Eilat. MK Aryeh Eldad (National Union) has filed a parliamentary query in which he asks Defense Minister Ehud Barak why the IDF is ignoring testimony about Egyptian soldiers' involvement in the murderous terror attacks near Eilat. "I would like to know why the IDF has refrained from questioning the civilians," the former IDF Chief Medical Officer wrote, "and whether it is possible that the investigation is being whitewashed and the public is being denied the truth, because of concern over exposing the truth about Egyptian involvement." One eyewitness said that the terrorists took care to fire at the wheels of the vehicles before they approached them. The terrorists followed this pattern with the vehicle that contained two couples on holiday before shooting them dead at close range, he said. His conclusion was that they wanted to abduct a soldier -- and murdered the four Israelis when they saw that they were civilians in their 50s, for whom they had no use. The IDF published Friday the results of its investigation of the terror attacks. It found that First Sergeant Moshe Naftali was killed by "friendly fire" from IDF soldiers and not by terrorists. Yossi, Moshe's father, said the family has no anger toward whoever mistakenly fired the shots that killed his son. "Our son is a hero who fought for the Nation of Israel and the Land of Israel," he said.